I have a few more lovely books for school that I want to let you all know about, although it occurs to me that these may be of even less interest to most of you than they are to me, since they’re not even genre-based. But who am I to say what you’re all interested in, right? This edition rounds up almost all of the remaining books for my schoolwork. There are still a handful of lingering books here or there, which I’ll throw up here in a future edition, but I won’t know what those are for a few more weeks (my science fiction/utopia course has four weeks of “you’ll all decide what we’re reading”). “Is there, today,” asks Jacques Derrida, “another ‘question of religion’?” Derrida’s writings on religion situate and raise anew questions of tradition, faith, and sacredness and their relation to philosophy and political culture. He has amply testified to his growing up in an Algerian Jewish, French-speaking family, to the complex impact of a certain Christianity on his surroundings and himself, and to his being deeply affected by religious persecution. Religion has made demands on Derrida, and, in turn, the study of religion has benefited greatly from his extensive philosophical contributions to the field. Acts of Religion brings together for the first time Derrida’s key writings on religion, along with two new essays translated by Gil Anidjar that appear here for the first time in any language. These eight texts are organized around the secret holding of links between the personal, the political, and the theological. In these texts, Derrida’s reflections on religion span from negative theology to the limits of reason and to hospitality. 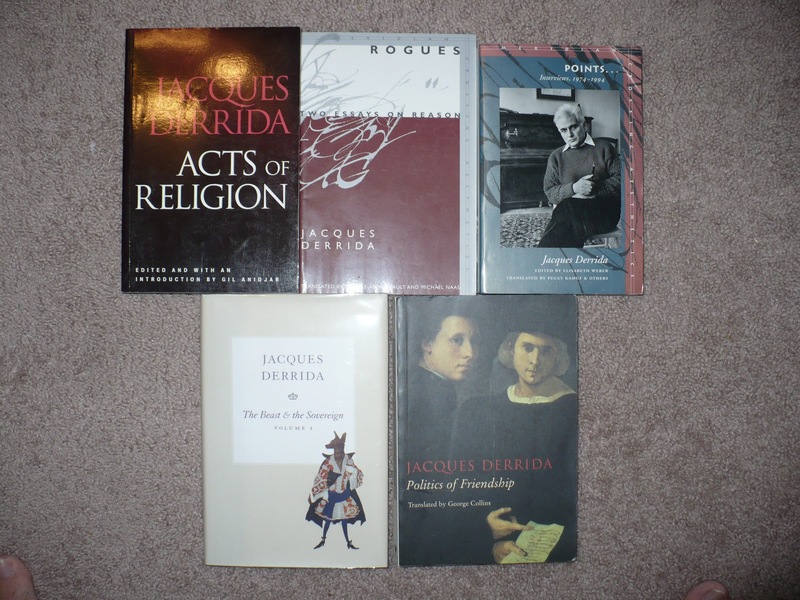 Acts of Religion will serve as an excellent introduction to Derrida’s remarkable contribution to religious studies. This volume collects 23 interviews given over the course of the last two decades by the author. It illustrates the extraordinary breadth of the Derrida’s concerns, touching upon such subjects as AIDS, philosophy, sexual difference and feminine identity, the media, politics, and nationalism. Until relatively recently, Jacques Derrida was seen by many as nothing more than the high priest of Deconstruction, by turns stimulating and fascinating, yet always somewhat disengaged from the central political questions of our time. Or so it seemed. Derrida’s “political turn,” marked especially by the appearance of Specters of Marx, has surprised some and delighted others. In The Politics of Friendship Derrida renews and enriches this orientation through an examination of the political history of the idea of friendship pursued down the ages. That’s a lot of Derrida, isn’t it? If you’re not familiar with Derrida, then maybe you should take a look at some of his work. I’d recommend The Animal That Therefore I Am, which I think is one of his easier texts and has a lot of very interesting ideas about the relationship between man and animal (specifically, the artificial divide we’ve created). I also just finished reading Rogues, which was really interesting, if not a little dense and difficult to understand at times. Whether you’re new to Derrida or not, are some of these books of interest to you? Let me know in the comments.